Walter S. Nicholes slid into the school bus seat next to me, nodded and asked me where I was from. Walter is from Shaker Heights. He is a World War II veteran. He served in the Merchant Marines; entered the academy in July 1942. He saw the world but not much of the war. When the D-Day landing was going on, Walter was in the Mediterranean. View a slide show of the D-Day Conneaut, Aug. 19, 2016, morning events. That’s one of the reasons he and his son came to Conneaut on Friday morning, Aug. 19, 2016. Walter wanted to experience the war he had “missed” as a Merchant Marine. The re-enactors, the machinery of war, the uniforms, the invasion – they would all serve to give him a taste of the fighting to which he and other Merchant Marines had been party by supplying and transporting the troops. Walter also wanted to bring a message to this event. 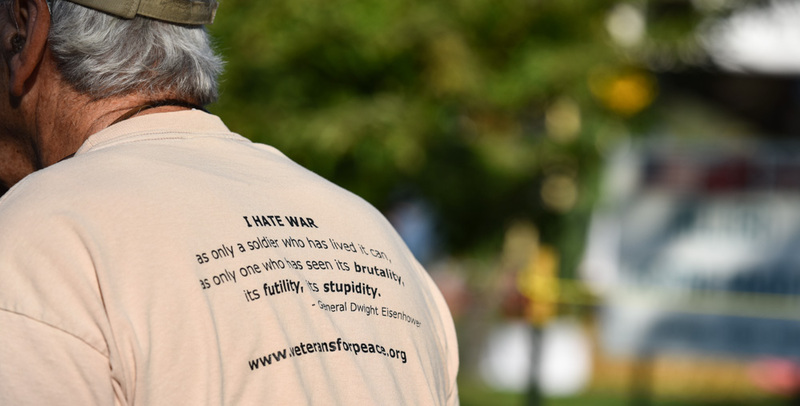 “To reveal to the public the full costs of war, and to end the use of wars as U.S. foreign policy,” Walter tells me. He gives me his business card with contact information and the website and mission of the group to which he belongs, Veterans for Peace. Five minutes later, the bus arrives at Conneaut Township Park, and Walter and his son are soon lost in the interpretive signs, the encampments, the souvenir stands and the events. I don’t see him again. Some might say Walter is an anomaly in this place, just as much as the World War II equipment and soldiers are anomalies and anachronisms in a place where people come to relax and have fun. There is tension in this park when D-Day Ohio brings its D-Day Conneaut Invasion to Conneaut every summer. There is the tension of facing down the enemy, of seeing the Germans as humans just like you and me. Of looking at the bayonets, and tanks, and guns that claimed the lives of Americans and made mothers weep rivers of tears and fathers grieve alone in the barns and pubs of our nation for decades to come. There is tension in making the transition from talking to re-enactors who are bankers, teachers, machinists and engineers when they are not in uniform, to the real soldiers, the World War II veterans who come on canes and in wheelchairs, with wives and sons by their sides, to be honored, remember, let their stories mingle with the other billions of words that have been spoken about this war. Walter hopes war will never happen again, at least not for money or power. He is not a pacifist, but he is no lover of war, either. And as a veteran, he has every right to speak his mind on the subject. After all, Walter S. Nicholes put his life on the line to defend that right. He did his duty back in 1942; and 75 years later, is still doing it. Thank you, Walter S. Nicholes. Thank you for serving; thank you for sitting next to me on that bus. I am honored to meet you.